Siem Reap, Cambodia and its famous ruins of Angkor Wat was my only contribution to the planning of this trip and I had the absolute best time of my life…so bear with me for a rather lengthy post. After wasting a entire day at the hostel bar in Phnom Penh, we set out to the bus station to take a sleeper bus to Siem Reap. Departing the station at 11:30 PM, we were expected to arrive at 6 AM. My father and I had two extremely different experiences – namely, he slept soundly and positioned his body like a triangle in our shared sleeper bunk, contentedly snoring as he pushed me against the railing while I tried in vain to shove him over. We arrived an hour ahead of schedule in Siem Reap, beating the sunrise. The hostel had sent over one of the tuk-tuk drivers that they keep on retainer and even though the bus was rather early, he was waiting for us with our names on a piece of paper. A tuk-tuk is a motorbike with a cart attached to the back that can carry up to four people, five if you really squeeze, and they are the main form of transportation for tourists in Cambodia. Cruising down the quiet, pre-dawn streets of the city, the differences between the disgusting city we had left only hours earlier and the pristine one we now found ourselves in were glaringly obvious. No mountains of trash. No putrid smell. No sickly dogs. Rather, beautifully maintained city parks were already bustling with joggers and groups of all ages practicing yoga. We even caught sight of a dog…wait for it…on a leash! 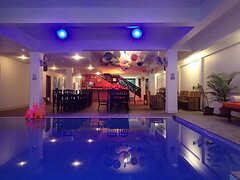 The Siem Reap Hostel pool and lounge area. As I mentioned, we arrived quite early to the hostel. Even though we could not check in until 2 PM, we were invited to enjoy breakfast and lounge by the pool until check in time. 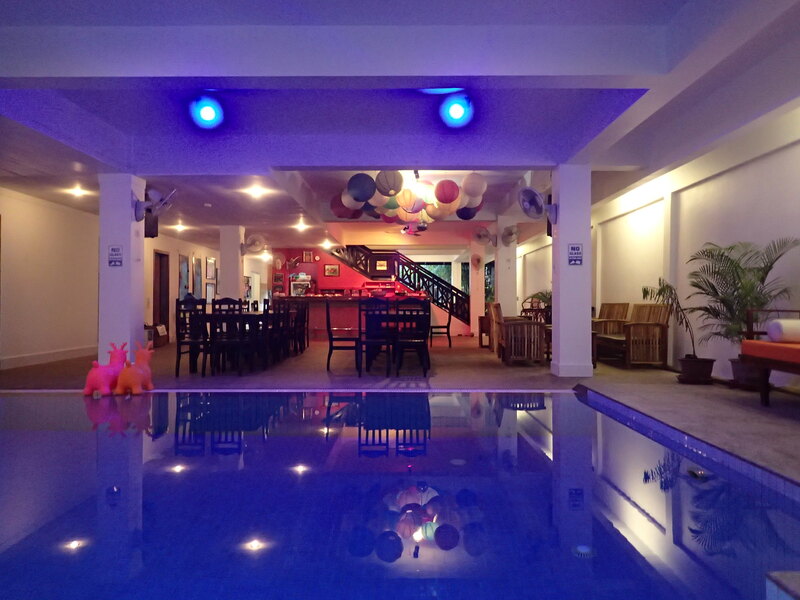 The Siem Reap Hostel is a well-known and well regarded hostel…in fact, it was named the best hostel in Cambodia for the last three years straight, and it is easy to see why. Aside from a beautiful lounge area surrounding a large pool, it also boasts a movie theater that shows free films each evening, reasonably priced spa services, yoga classes, walking tours of the local street food, and many daily excursion packages to temples and floating villages and silk farms. While we wait to check in, we confer with our tuk-tuk driver and set up a plan for visiting Angkor Wat, which for all intents and purposes is really the whole reason we are in Cambodia at all. This is my shining jewel of the trip. A gorgeous photo in the lobby and our knowledge of the oft mentioned Southeast Asian heat convinces us that starting the tour at sunrise the following morning will be best. In order to make the most of our time, we decide to buy our tickets ahead of time and take advantage of a very brief window of time at the end of the day in which entrance to the park is free. After obtaining our tickets, our driver zooms over to the temple that promises a beautiful sunset view. Before entering, Lanza is stopped and advised that his cargo shorts are too short. His two inches of exposed knee are far too scandalous, and he is asked to pull his pants down until they are practically falling off and his boxers are exposed. Apparently dressing like a gangster is preferable to a slightly exposed knee, and I cannot stop giggling the entire time he struggles to adhere to dress code. Of course the second we walk away he hikes his pants back up, but I will forever cherish those few hilarious moments. After a rather lackluster sunset, we headed back to the hostel for what was planned as a quiet night in. The next morning promised a 4 AM wake up call in order to make it back to Angkor Wat before sunrise. However, I was weak and gave in to grabbing a late night dinner with a group of follow travelers as long as they promised to get me home by 11 PM. I crawled into bed at exactly 10:59 PM. The next morning Lanza shook me awake at 4:25 AM. I felt drunk from lack of sleep. I was barely able to figure out how to put on the oddly designed pants I had picked up at the temples the night before and nearly fell asleep as I shuffled into the tuk-tuk. It was still completely black when we pulled up. Phone flashlights were required to navigate our way across a bridge with seemingly random up and down steps and a stone path that lead to two reflecting pools in front of the most famous building at the site. As the sky lightened and the outline of the temple became crisper, the crowd thickened by the second. It was a cloudy morning and soon it became pretty obvious that the spectacular pink and orange watercolor sunrise promised in all the tourist brochures was not going to appear, so we made the executive decision to ditch the masses and work our way to the entrance of the temple. Once we were allowed in at 7 AM, we followed what we refer to as the “Disneyland” method of seeing the sights, in which we rush immediately to the back and work our way forward, avoiding all the (other) tourists who quickly get distracted by the sights. The first temple is the namesake of the entire sprawling complex that contains many, many more temples of both the Buddhist and Hindu faiths. As such, it has been restored the best, and I can’t help but run my hands across the intricate carvings of gods and flower patterns that cover the walls and gaze up at the impossibly high ceilings. It seems miraculous to me that these impressive structures could have been built so long ago. We wander through a labyrinth of hallways, duck through archways, twisting and turning our way through the enormous structure. One could spend several hours just in this one building, and I am sure many do. We wander out the back exit and stroll through an immaculate forest. The shades of green surrounding us are so lush that the landscape seems slightly unreal and more like an oil painting hanging in a grand hall somewhere. When we loop back into the main temple, we explore a different route than before (though to be honest I doubt that we could have matched our footsteps exactly if we tried). I follow the sound of chanting and drumbeats down a hallway and stumble upon two child monks in orange robes. They are chanting a repetitive prayer and blessing a tourist with holy water as he kneels on a colorful mat before them. Obviously I had to get in on this, so we tossed the equivalent of 50 cents into their collection plate and I too dropped to my knees, head bowed and hands clasped. For all I know they could have been chanting “Look at this dumb white girl!” and tossing tap water on me, but I was moved nearly to the point of tears nonetheless. That brief moment on the tour is a memory that I will not soon forget. As I mentioned before, Angkor Wat contains dozens of temples and other buildings across many acres of land. To properly explore the entire ancient city would take a week; we have one day. 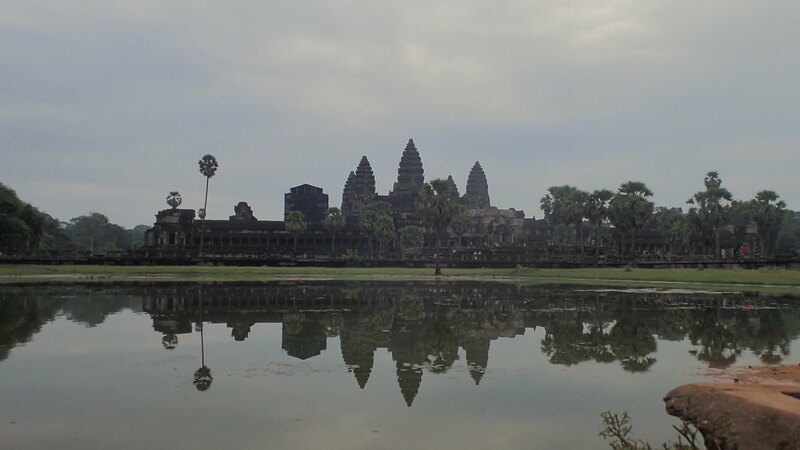 Thus, the four temples included in the package we opted to pay for merely scratch the surface of what the most popular tourist attraction in Cambodia has to offer. A tuk-tuk driver is basically a necessity, as many of the temples are far apart and you would waste half the day walking between them. We work in a large loop, although technically our tour is called the Small Circuit, and each temple has given up more of itself to nature than the previous. These are the temples I have been looking forward to most, however. 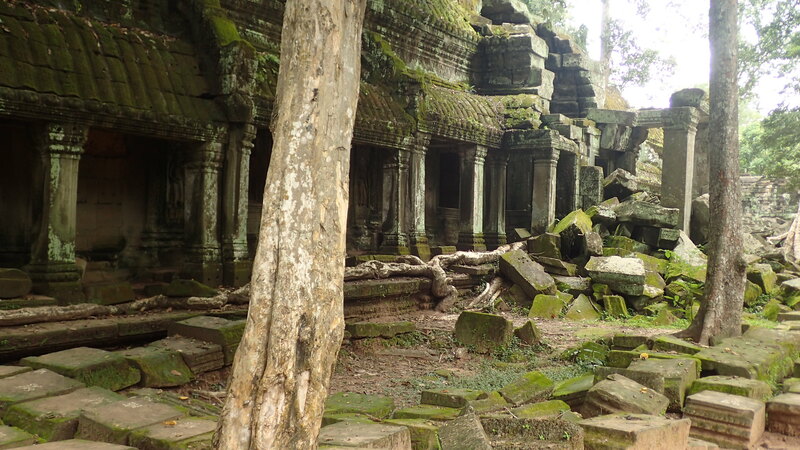 In the last one we walk through (which, fun fact, was where one of the fight scenes in Lara Croft: Tomb Raider was filmed), I find myself climbing over tree trunks that have willed their way through gaps in the stones, many of which are now covered in a layer of bright green moss and tangles of ivy. I am struck by an awesome appreciation of the tenacity of life, the passing of time, these figurative and literal bridges connecting the past to the present. By 11:30 we are exhausted. A combination of our early wake up call and climbing up the absurdly steep stairs found on most of the ruins has left us eager for a nap. Plus the heat. Can never mention the heat too many times. Once back at the hostel I crash for several hours, but wake up ready to party with the friends I made the night before. Lanza accompanies us to dinner, even though neither him nor I actually eat because the food at the hostel is too delicious to pass up. He politely declines coming to Pub Street with us (reading between the lines, “You guys go ahead without me” translates to “I would literally rather eat glass”), so I head out with my motley crew of Germans, a lovely Polish girl, and a fellow American. How to describe Pub Street? Madness. 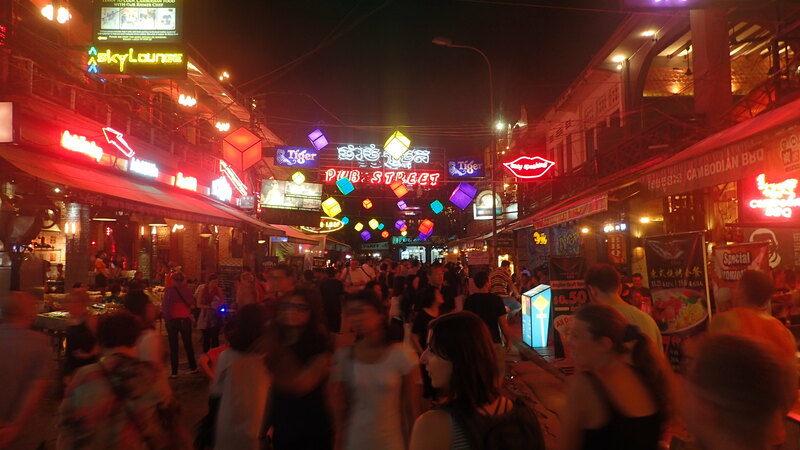 Westerners and Cambodians and Chinese tourists, all tossed together in an alcohol fueled cloak of anonymity. Arching over the street are enormous signs that read “PUB STREET” in English block letters. Between the bars and clubs and restaurants that compose the main strip are tiny alleyways that lead to even more bars and clubs and restaurants. Still can’t find that perfect cocktail? Not to worry! The smoothie stands that are so prominent during daytime hours have been replaced with portable tuk-tuk bars…very literally just a motorbike with a fully stocked bar and speaker system attached to the back. We settle on a bar with the punny name “Angkor What? !” It is a seedy little place with graffiti covered walls, black lights, and ridiculously cheap alcohol. So, my kind of heaven. One “bucket”, which is served in a cup that you can easily wear as a hat if you don’t already have alcohol poisoning when you finish, costs $10. I split this with a friend, and managed to get drunk for $5. I regret using the term “competing bass lines” in a previous post, because Pub Street makes the bar scene in Ho Chi Mihn City look like Bingo Night at the local senior center. On more than one occasion, it was impossible to figure out which song was playing at the bar because the music at the club across the street was so loud their melodies and drum beats intertwined and created a symphony of confusion. When the song playing across the street seemed to be better than what Angkor What?! had to offer, my lovely Polish friend Izabela and I would simply toss our purses at our male companions and skip into the street, where dozens of people who couldn’t be bothered to actually enter the club had started a dance party. Despite nearly fainting about five times, I had the time of my life. 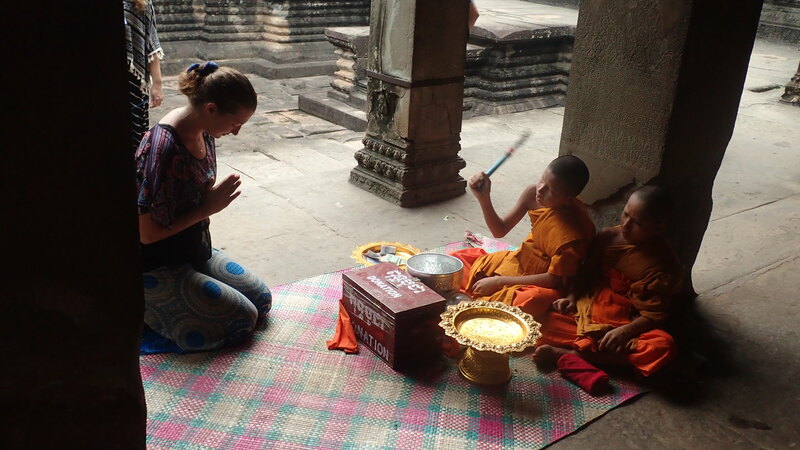 This was part of the magic of Siem Reap for me. Both halves of my little tourist heart were filled within 24 hours. In the morning I was blessed by child monks; in the evening I was dancing on tables to the latest Top 40 hits. What more could a girl ask for? Share the post "Blessed for 50¢, Blasted for $5"
Great pictures Erinn! You sound like you are really enjoying your trip! What a once in a life time experience you are doing! Your blog is so interesting. Enjoy!